With a husband, eight children, and farm hands to cook for, my Swedish grandmother Anna Larson Bowman had her hands full. One of her go-to recipes was Peparkakor, a spicy cookie that naturally found its place during the holiday season. Now, I bake them myself. Around our house, they're very much in demand. My mother published the recipe in a cookbook she made for us kids. I'm not sure why, but I always end up using a lot more flour than she called for. They come out chewy and delicious, and they're especially good with milk. 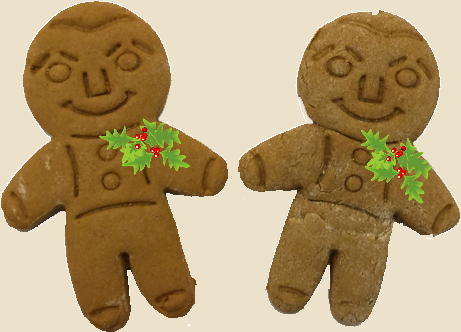 This recipe will make about 100 gingerbread men, or 150 2½" cookies. (As I say, she baked for farmers.) You may wish to cut it in half. Pour molasses into a saucepan, and heat over medium-high just to bubbling, stirring constantly. Fold in sugar, and stir constantly until sugar is dissolved. Pour into a large bowl, add butter, blend, and let cool. The butter will rise to the top, but that's okay. When the molasses mixture has cooled below about 130° F, fold in the eggs, sour cream, and orange rind, and beat with a whisk until smooth. Add the dry ingredients and blend well. It'll be a workout. A wooden spoon works as well as anything. If you want to make round cookies: Shape the dough into several rolls, wrap in wax paper or plastic wrap, and chill overnight. Then you can just slice and bake. For cutter cookies: Chill in the bowl overnight. Then you can carve out chunks, and roll them out to 1/8"-3/16" on a floured surface (flour the dough as you go). Keep your cutters floured; toothpicks will probably come in handy to remove the dough from the cutter. Place the cookies on ungreased sheets and bake at 350° F for about 12 minutes. 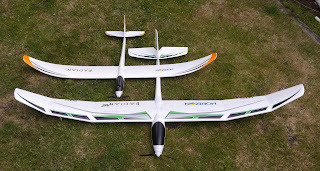 Horizon Hobby’s new EFlite Radian XL electric-assisted-launch sailplane is firmly in the tradition of those that preceded it: it performs well at its intended tasks, it’s evident that design problems with earlier models have been addressed, and it leaves a bit to be desired. Here’s a first-look review of the design and its implementation, the packaging, and initial flight tests. As you can see from the photo, the XL dwarfs the standard 2-meter Radian. The wing span is 2.62 meters, or 103 inches. I expected that the larger wingspan would also have a higher aspect ratio, but this is not the case; in fact, it’s just a tad lower: root chord has increased from 200mm to 275 mm. This is a result of the retention of the flat-bottom profile, which is in turn related to the chosen material (Z-Foam, same as the 2m). The fuselage has been lengthened proportionately, so that the plane is, overall, just about a 30% scale-up of the Radian 2m. Tail surfaces are noticeably larger. All-up weight on my XL was 2518g, as opposed to 816g for my 2m; that’s a factor of 3.1! The XL is powered by a 1250Kv outrunner brushless motor driving a 12x4 propeller. That’s quite a bit more pulling power than the 480-type motor driving a 9.75x7.5 prop in the 2m – and the XL needs that additional power, and then some. I’ve been told that the 480 is rated at 920-960 Kv. Given the weight difference, that makes the XL look somewhat underpowered. The Radian XL box is about three inches longer and two inches thicker than that of the 2m, so you will probably be able to transport it just as easily. In my case, the foam container is a very tight fit into the outer paperboard box. I’ll either discard the box, or change it so that it opens from the top rather than from one end. The parts were packed in three layers inside the box; repacking everything is like putting together a jigsaw puzzle. I recommend marking the foam inserts to indicate packing order. I also recommend modifying either the box or the rudder to allow repacking of the fuselage into the box. Keep reading for more on this. The canopy is molded foam, like the plane, about a half inch thick. It is secured with a forward tab and an aft pushbutton latch, rather than with magnets. It should be much less likely to come off on hard landings. There is plenty of room in both the cockpit and the servo area for additional instrumentation. The receiver, like the servos, is fastened securely in place. If you need to rearrange the servo connections to the receiver, use small fingers. 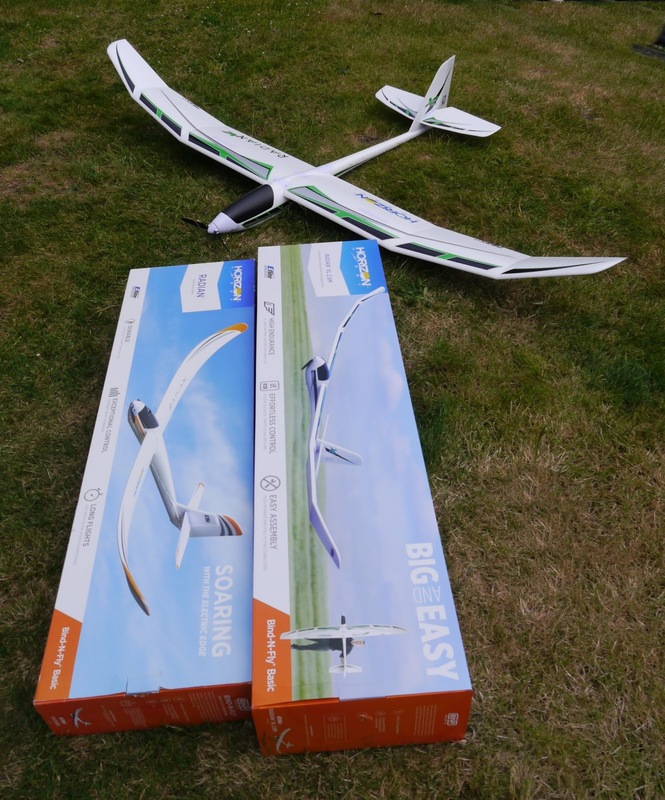 With the recommended 3200mAh EFlite 3-cell LiPo battery, which weighs 260g (as opposed to the 100g of the standard 1300mAh battery on the 2m), the plane balances as recommended in the manual, if the battery is placed in its rearmost position. Sherman recommends trying a lighter battery. More on this below. A Velcro-type strap secures the battery side-to-side. 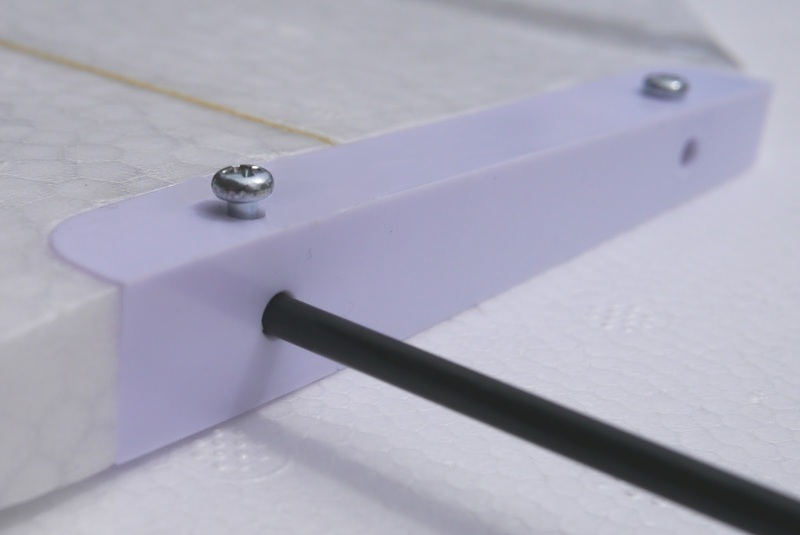 A small piece of sticky-back Velcro is provided with the kit, to prevent the battery from sliding fore and aft; usage is highly recommended. The receiver includes AS3X stabilization, which is effective but may be turned off. More on this below, also. The rudder linkage, as on the 2m, runs along the outside of the fuselage. As the elevator mechanism is embedded inside the vertical stab, the elevator linkage is entirely inside the fuselage. Note in the photo above that it runs inside a very substantial carbon tube that extends most of the length of the aft fuselage and about 2” into the servo compartment. That tube makes the fuselage very stiff, and removes the tendency of the control tubes, in the 2m, to come unglued from the fuselage. You’ll notice that the solid center wing section obviates the need for a wing rod. This is good, because sometimes I forgot to take mine to the field, or to put it in (ouch!). On the other hand, you now have four composite wing joiners and a couple of plastic alignment tabs that must be secured with six small screws. Note also that some assembly is required: as packed, the rudder is not attached to the vertical stab. The rudder has three flexible plastic hinges, which you must slip into corresponding slots in the stab, and secure with a few drops of thin CA. 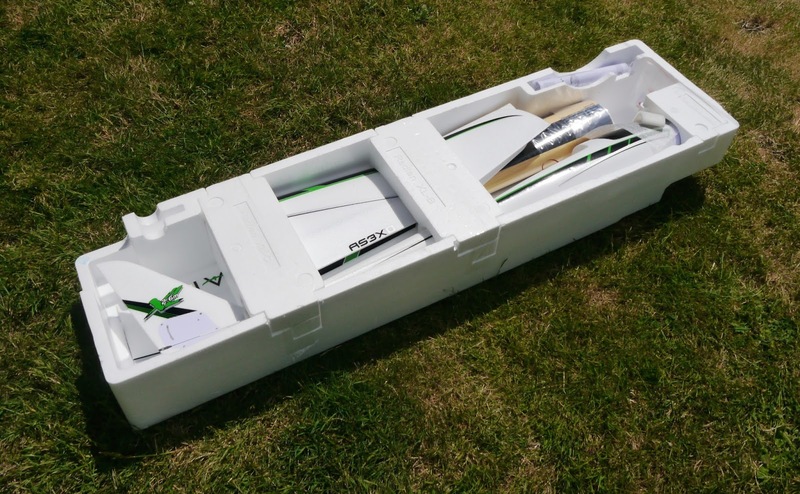 Unfortunately, once you’ve done this, you can’t really get the plane back into the box: you run the risk of damaging the trailing edge of the rudder or of introducing a set into the hinges. One way around this would be to cut the rudder back off and trim the hinges flush with the foam; then install a hinge with a removable pin. You could also perform surgery on the foam box and extend it a few inches, using foam from one of your many boxes from previous Radians. 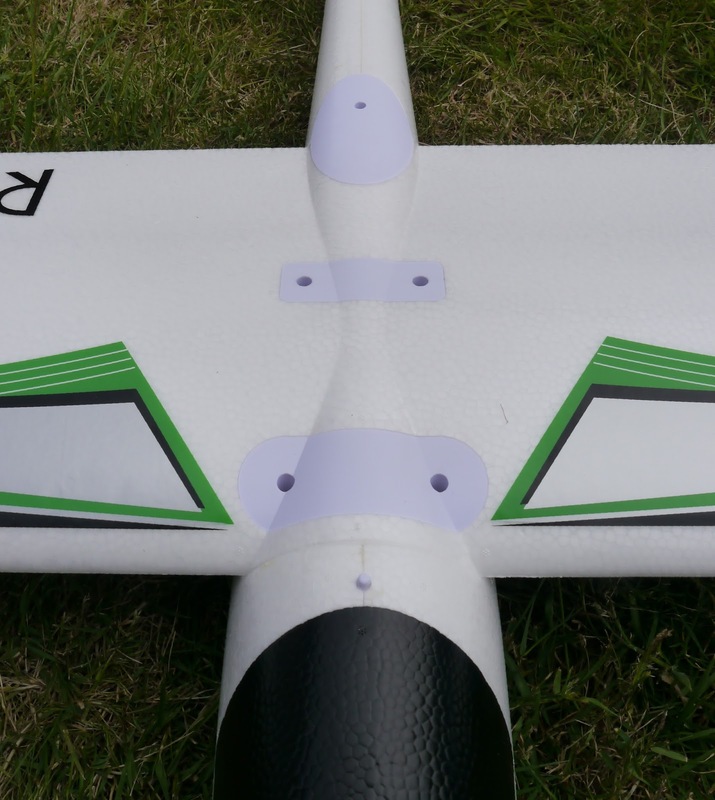 The elevator on the Radian 2m has been converted to a full-flying horizontal stabilizer. 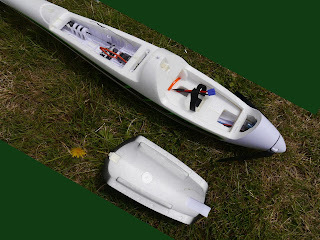 It’s much beefier than the stab on the 2m, and we no longer have the work of modifying the decalage for better performance: just select it via adjustments to the servo linkage or the trim tabs on your transmitter. 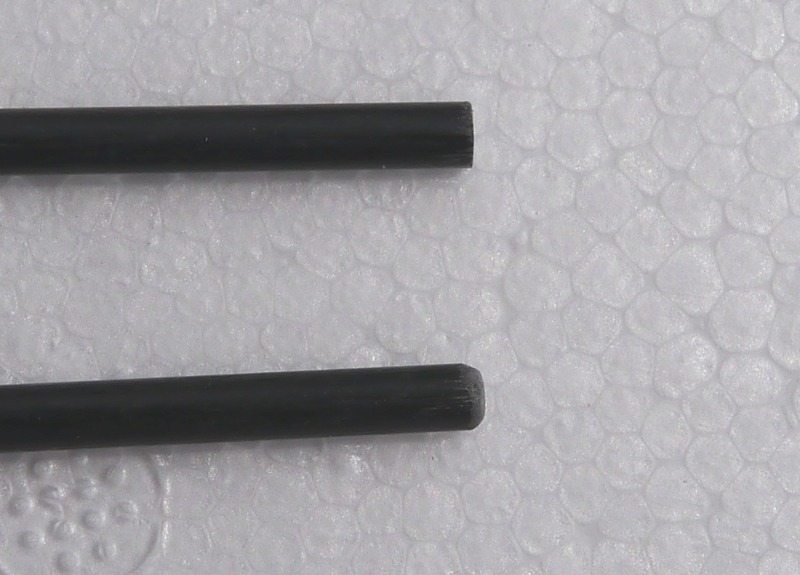 The two halves of the stab are joined with carbon rods which pass through the vertical stab and are secured with screws, which act as setscrews. Here I encountered a manufacturing defect: one of the metal plates through which the setscrews pass was not tapped to accept the screw (the photo shows that I could not screw it in all the way). If you have the same problem, don’t try forcing it: it won’t work. Luckily, my son had a 2.5 x .45 mm tap that made for an easy fix. Another recommendation: use some fine sandpaper (e.g., 400 grit) to round off the ends of the carbon rods. This will make it easier to slip them in and out of the stab halves. The photo shows the original rod end on top, and a rounded end on the bottom. The spars are quite evident when you view the wing from the bottom (photo at right). Note also the control linkages from the wing-mounted servo to the spoilers. 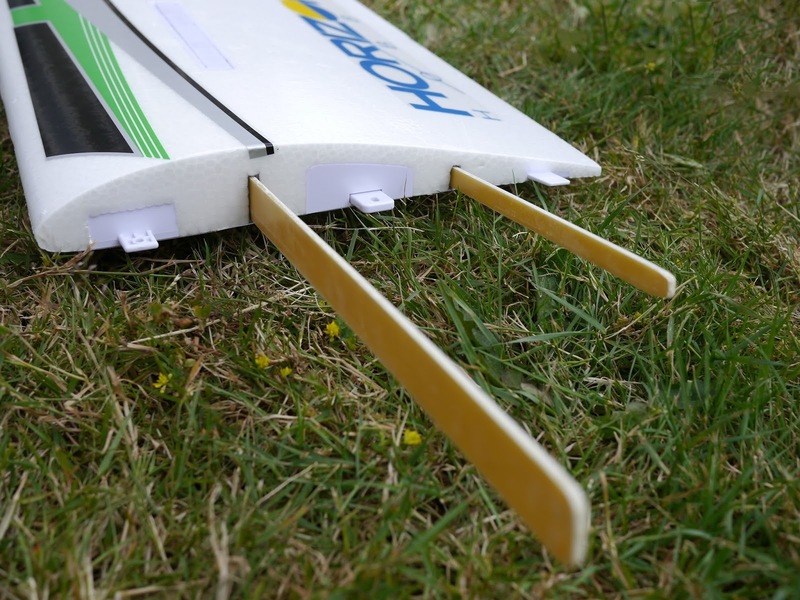 After the spoiler servo is connected, the assembled wing is secured to the fuselage with five screws that fit into posts in the fuselage. 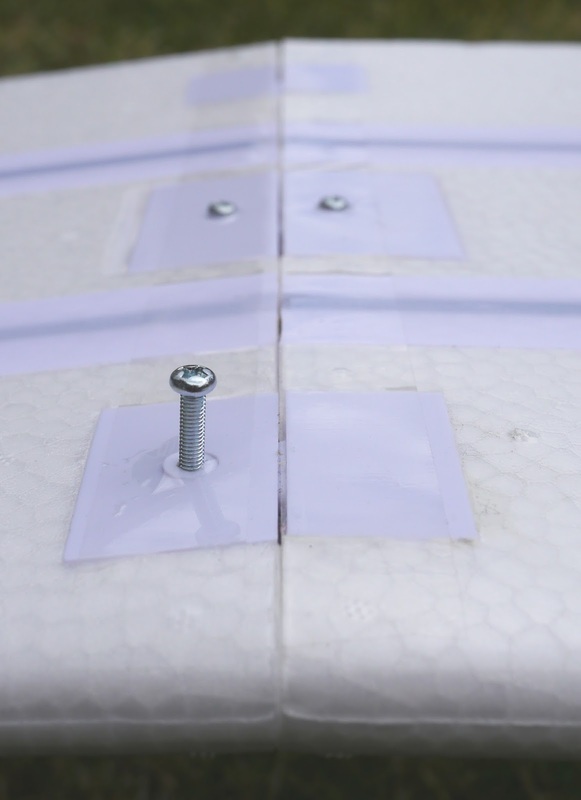 All connections seem to be quite secure – but between the outboard panels, the wing, and the horizontal stab, there are a total of 15 screws to install every time you put the plane together! And they are four different sizes! You may wish to color-code both the holes and the screws with four different colors of foam-safe paint. And, even though a few extra screws are provided, be sure to do the assembly over a drop cloth: you'll never find the screws in the grass. For the size of the wing, the spoilers look undersized. They’re effective, but I think that another couple of inches could have enhanced their effectiveness. 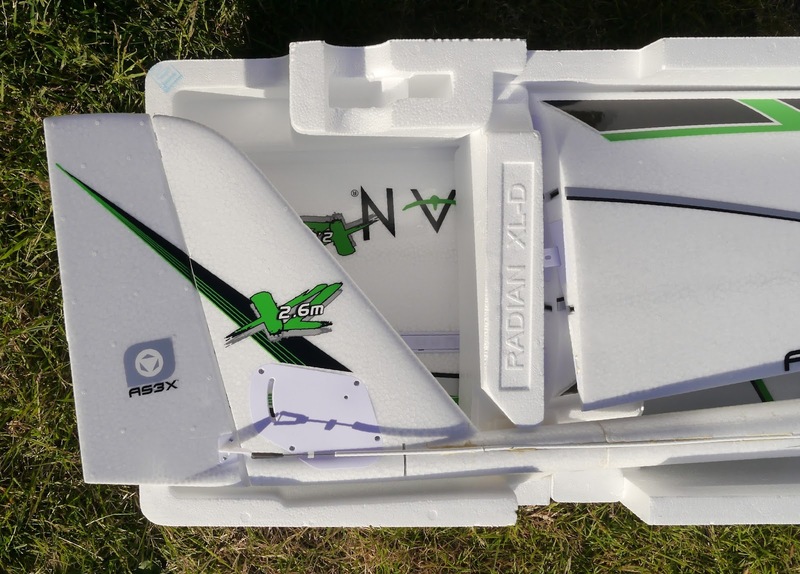 If you’ve flown a UMX Radian, you’ve noticed that it doesn’t really fly like a 2m Radian. Likewise, don’t expect the 2m and the XL to be on equal footing in a contest. I fly Hitec Aurora. For testing the XL with the built-in Spektrum receiver, I used a DX5 that I had lying around. It was a nuisance to set up the channels – I sure missed the programmability. Oh, well – at least I didn’t have to worry about escapements and mechanical mixing. You’ll want to put the spoilers on either the left stick or a slider, so that you can accurately control your glide path on final approach. The DX5 doesn’t have sliders, so I had to put the motor on a toggle. If you need to do that, I recommend configuring the ESC for a one-second startup to avoid strain, both on the drive system and on your grip on the plane. There’s also a .25-second startup option; but I like the longer one. There are small indentations on the bottom surface of the wing, next to the fuselage, that indicate the recommended CG point. Hand tosses indicated that the plane with the recommended 3200mAh battery was reasonably well balanced. So I went ahead with a powered launch. The launch can be most accurately described as stately. I could almost hang the plane on the prop, but altitude gain was minimal. So there was the first difference between the 2m and the XL. I found best practice to be a flat launch of 50’ or so before allowing a climbout of somewhere between 10° and 20°. Too steep an angle results in mushing and waste of battery. So don’t expect any kind of advantage in timed-launch rounds. With altitude-limited (ALES) launches, it will be a bit nerve-wracking, trying to hit max height in the typical 30-second period before automatic motor cutoff. Once the plane reached altitude, it performed very well. Given the airfoil and weight, I expected a lumbering behemoth. But it thermalled well and was pretty good at indicating updrafts, although not as bobbly as the 2m. After a little tweaking by Sherman, it performed well in the dive test, although he thought that it would perform better with a smaller (lighter) battery which could also shift the CG back a little. (The recommended 3200mAh battery, at recommended CG, is against the aft bulkhead, so cannot be shifted back any further.) I tried using one of the 1300 mAh batteries, but it was too light to make the plane balance. So I strapped in two side-by-side. The plane flew just fine, but I don't think lowering the weight by 60g made a perceptible difference in handling. The AS3X stabilization may (or may not) affect the plane’s ability to read the air. I haven’t flown it enough to get a handle on that. It is possible to reprogram the receiver (at least, on the UMX Radian) to allow stabilization to be selected via a transmitter toggle. I will be installing an Aurora receiver, so will soon find out how much difference stabilization (or the lack of it) makes. Glide ratio appears to be every bit as good as the 2m. So if you could max out a 10-minute round with the 2m, you shouldn’t have any problem doing it with the XL. With the added benefit of spoilers, it’s the landing portion of the round where the XL should shine. The spoilers were quite effective at steepening the descent – although, as I mentioned above, it would be interesting to try spoilers that were a little larger. In many planes, the loss of lift triggered by the spoilers must be compensated for with some up elevator. But this effect has apparently been minimized by the overall plane design: only slight elevator correction was needed. Note, however, that the spoilers do not reduce landing speed: you’ll need to use elevator to keep speed under control. After flying a Radian 2m for years, I felt that it was somehow cheating to use spoilers to control the glide path: no more (well, not nearly as much, anyway) zigzagging back and forth to make those pinpoint landings. But you’ll still want to have good control over both your speed and your rate of descent: dork landings are not recommended, and the XL, with its much greater mass, has a much longer slide path over the grass. The Radian XL started shipping in early- to mid-June. Demand seems to be high, as it quickly went to back-order at Horizon Hobby. I ordered mine at just the right time, and there was no wait. Not to mention a good price: list was $270, but Horizon Hobby had two different coupon offers going, which lowered the price to $189 – not much more than the cost of the 2m. As of 6/30/2016, Horizon had the XL on sale for $230, with an additional $20 off, it appears, if you use coupon code FOAM. I also used coupon code FL32-GXNF-GD3U, found on RCGroups, for an additional discount, but don’t know if it’s still active. 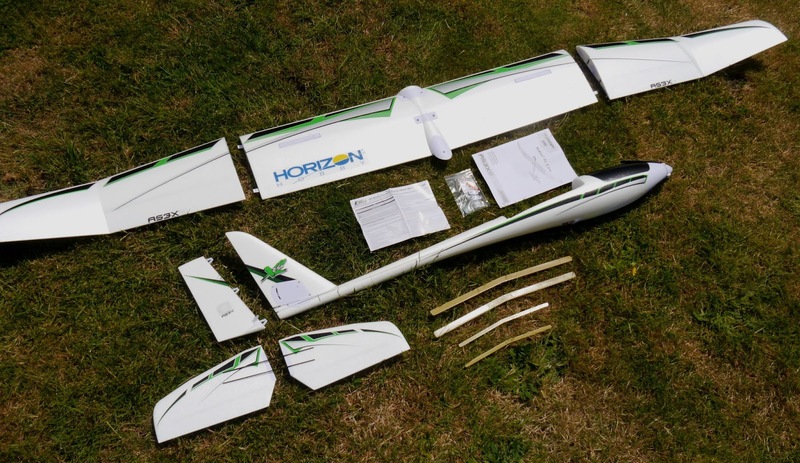 On July 6, Horizon Hobby issued two service bulletins (linked below) dealing with apparent failure, in the early manufacturing process, to adequately secure stiffeners in the fuselage under the vertical stabilizer and the doublers that join the halves of the wing spars in the center section. It is the work of a half hour to correct this oversight with some thin CA. Subsequent models, identified with a sticker on the box or near the affected areas, will have had the defect corrected at the factory.